A few last decades ago, the world has received new technology, was a new discovery of current generation, so-called “Information Technology”. More than this, an information technology helped to our human being for all wide sectors is not only health, economic, telecommunication, educational sectors but other sector also needs it. Cambodia, in doing so, has gotten this factor in order to develop and building up its own country. Meanwhile, Cambodia has necessity to IT, especially inquiring for basic documents so that making an easy to its citizens through researching, and study materials for students who are studying at any university level in Cambodia, in particularly information technology. According to these needs, IT magazine was created through buying an IT magazine, namely PC WORLD CAMBODIA and after that it changed its name into “IT CITY MAGAZINE”, dated on May21, 2004 in accordance with PRAKAS (Declaration) No 157.04 P.M.BR.K. In order to more attractive its readers, the magazine have reformed many matters on printing, including contents of magazine, lay out, designing cover page; reshuffle of magazine’s managements that consist of adding more experienced staffs to improve their job both making news and editing. Addition to this work, when the magazine was printing out to the public it increases more pages, starting from 88 pages to 100 pages and it issued monthly two times, in which have 18,000 copies for 24-province and town of around the country. It should be recalled that the whole reforming like as mentioned above, widely recognized by the Ministry of Information, Kingdom of Cambodia. IT CITY MAGAZINE, a leading magazine for circulating, and also leading guide of informative technology in Cambodia. In particularly, in order to contribute human resource training on information technology via providing knowledge to all Cambodian people who has needed this field, because this sector always updated forever. 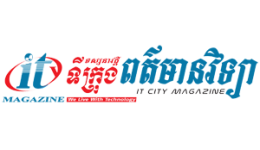 IT CITY MAGAZINE, Khmer language magazine with high quality and always brings a hot news and currently news, relating to IT-based knowledge to all of you first in Kingdom of Wonder, and accordance with professionalism ethic. The magazine, however, has designed with colourful meaning and comprehensive angles to making easy get IT knowledge to its readers. To gain more credibility, and leading image on IT market in Cambodia, the magazine has strongly commitment to deserve its own customers through providing highly trust, based on strongly supporting from the readers, consist of other companies have run their business in Cambodia. IT CITY MAGAZINE’s currently address, located on #8AEo, St 156, Sangkat Veal Vong, Khan 7 Makara, Phnom Penh (the East of Depo market, proximately distance 20 meters), its own location. IT CITY MAGAZINE, potentially, has distributed to 24 town-provinces in Cambodia and among of those area are best sell including: Phnom Penh, Preah Sihanouk, Siem Reap town, Banteay Meanchey, Kandal, Battambang, and Kom Pong Cham province. Dealing with all the questions relate to value readers via e-mail, on phone free of charge and available working times. Providing two special hotlines for its customer (012 999 140 for Cellcard network and 6767 for Smart & Starcell network) pay only 3 cents for one minute. Showing your company logo on IT CITY magazine website by free of charge. Under co-operation with Cambodian Television Network (CTN) to establish a computer show that is so-called (CTN Interactive), broadcasted for every Monday-Friday at 11:00AM. In co-operation with Mobitel, mobile phone company, IT CITY Magazine received a hotline at 012 999 140 and Smart Mobile company at (6767) in response to nationwide customers’ questions, relating to computer knowledge by paying only 3 cents for one minute, especially customer who has used Cellcard and Smart network. More than these activities, IT CITY Magazine has promoted its products to value readers through products exhibition in main company locations in Phnom Penh such as IDG, Mega Asset, ICT Career Forum, IEM…. After it has run business successfully for 2-year, IT City magazine company began its second magazine namely “Phone City Magazine”, recognized by the Ministry of Information. This magazine issued in the first time on February01, 2007. Phone City Magazine has focused on phone technology and providing further more information on phone technology, including interpret what phone tech development today age, especially phone models are coming on Cambodia market. On December 1st, 2009, third magazine begun, under recognized by the Ministry of Information of Kingdom of Cambodia. That magazine was named “Chanras”, not focused on technology but mainly aims to social, art, and various educational issues. Today, three magazines were widely recognized from value readers around country is not only from readers but also other companies, been run their business at the market. Moreover, those companies have found that three magazines are the best seller with colourful meaning in the context and also brought news package to their customer accurately and timeline. By response to all requests and recommendations from dear readers, on June 1st, 2010 in which 6th anniversary of establishing IT CITY Magazine and this magazine has enlarged a new center, is called “Information Technology Center” in order to training on IT specialization.